Has McCain selected Eric Cantor as his VP ? With Joe Liebermann hanging out suggesting people could it just be Cantor ? Rep. Robin Hayes is predicting that Sen. John McCain will pick Rep. Eric Cantor of Virginia as his running mate. Hayes made his comments during and after a meeting with educators at Jack Britt High School. Rumors about Cantor have been spreading in recent weeks and began to grow stronger on Tuesday, Hayes said. Several media outlets are reporting that Cantor has come under serious consideration. Cantor is a fourth-term Virginia congressman representing parts of Richmond and several counties to the northwest. He is chairman of the Congressional Task Force on Terrorism and Unconventional Warfare. Cantor also holds a seat on the powerful House Ways and Means Committee, which has direct jurisdiction over taxes, trade, Social Security, Medicare, prescription drugs for seniors, health care and welfare reform. In December 2002, he was selected to serve as chief deputy majority whip, giving him a seat at the House Republican Leadership table. Friday will be McCain’s 72nd birthday. Cantor is 45. 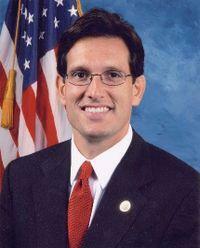 Cantor and his wife, Diana, have three children, Evan, Jenna and Michael, who attend Henrico County Public Schools. The Republicans begin four-day convention on Monday in Minneapolis. Cantor was “prominently missing from the list of speakers for the convention in Minneapolis,” Hayes said.